Thank you for providing a countertop plan view from above with its measurements, length and width of the track (for a good hold of tin in time, maximum width 45-50cm). Please specify whether or not you want an interior lift (see our Manufacturing page for more details). Important : as for the choice of the border, thank you to note all the faces where the border will be put because the price is calculated according to the developed border. For your kitchen or American bar, work plan or central island …, please note that tin fears heat, it can not be used near a heat source (oven, hob). The bowls will be brushed stainless steel recessed in the tin top (no bowl or tin drip). For any question, we are at your disposal by mail atelier.nectoux@wanadoo.fr, phone +33 (0)1 46 98 03 11 or via our contact form. 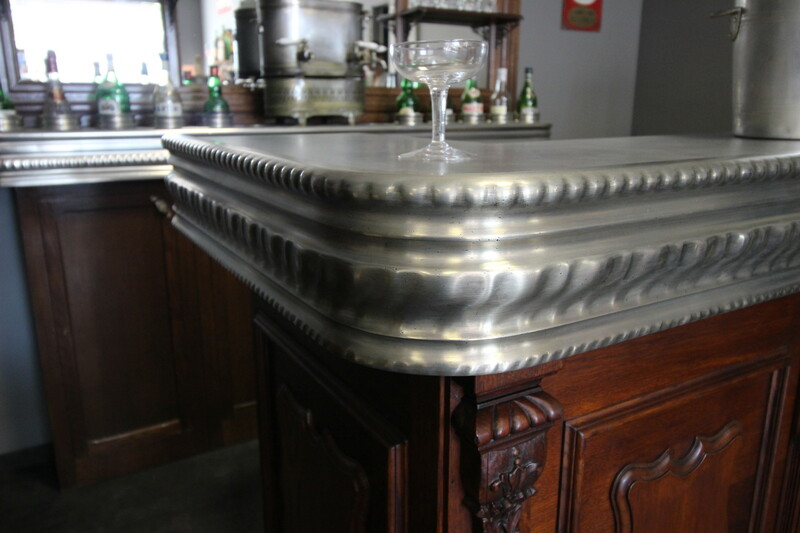 We offer counter borders pewter style 1900s – 1930s and special borders for tables and pedestal tables.